As a dietitian/nutritionist, I receive a lot of questions about which sweetener is best. There are many angles to this question, so instead of making this an extremely long post, I’m going to break up the discussion over the next few weeks. Today will be focused on my favorite sweetener. Next week, I’ll be playing the role of judge and jury in the ultimate smack down: sugar vs. fructose. If you read this blog often, you know I possess quite the sweet tooth. Probably many sweet teeth because as healthy as I try to eat, I really enjoy my sweet treats. A square of dark chocolate here, a strawberry cupcake there, I’m pretty good at leading the sweet life. While I keep it balanced with occasional sugar-free challenges, I have made peace with the fact that I need dessert in my life. I do consult with many clients who are perfectly content with removing sweets (excluding fruit) from their diet; however, that’s just not realistic for me. And, the way I look at it- I don’t have to. By limiting my consumption and being picky about which sweeteners I use, it’s a balanced win-win approach. Of all the sweeteners available, my go-to choice is 100% pure maple syrup. Besides the incredible taste, I know I’m also getting some bang for my nutrient buck as maple syrup contains 54 different polyphenols, a similar antioxidant profile of berries & teas! While it’s rare for me to have much of an appetite immediately following a workout, if you show me something sweet–game over. As a result, I usually keep a pack of chocolate protein balls sweetened with maple syrup in my freezer to enjoy post-run. I feel good knowing that while my snack is delicious, it’s also providing my body with what it needs; maple syrup contains potassium (to help regulate fluid balance) & manganese and zinc (vital for muscle recovery). Bottom line…if given the choice among sweeteners, I’m choosing maple syrup every time. 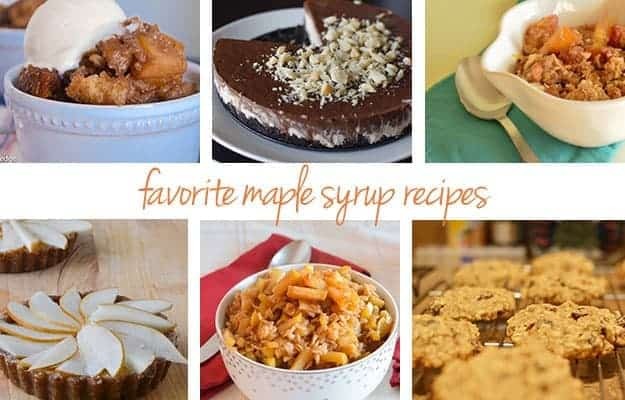 As I was writing this post, I noticed that most of my sweet (and some savory) recipes featured maple syrup. If you’re anything like me then you’re looking for easy, delicious & healthy sweet treats this time of the year. Well, I’ve got you covered! Below is a roundup of my favorite maple-containing desserts. Great post – there is so much conflicting information out there about sweeteners and sugar in general. I look forward to reading the rest. I bought my first jar of real maple syrup a couple months ago and couldn’t believe how delicious it was. Also those chocolate protein balls sound yummy!